Minneapolis - The co-main event saw top contender Sergiy Derevyanchenko (13-1, 10 KOs) earn a hard-fought unanimous decision victory over Jack Culcay (25-4, 13 KOs) in an IBF middleweight title eliminator. 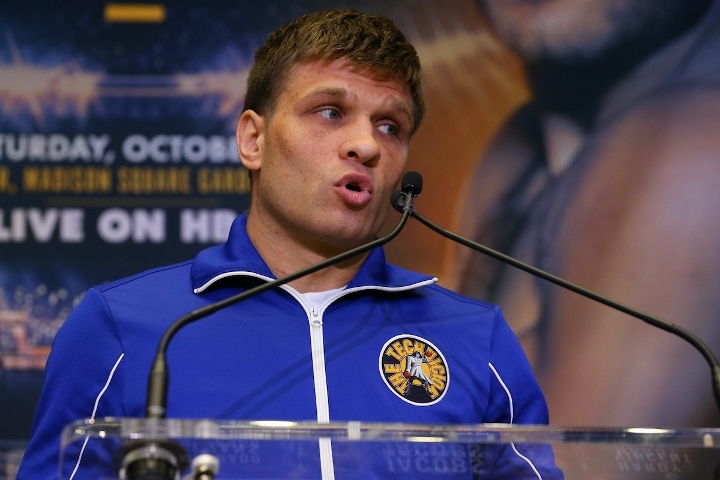 "I knew that he was going to move a lot," said Derevyanchenko. "We prepared for it because we knew what kind of fighter he was. My mentality was that I had to seek and destroy." "My strategy was to use my jab and control the distance, because I had the height advantage," said Derevyanchenko. "I wanted to put pressure on at the right times and fight smart." As the fight went on and Derevyanchenko looked to be taking control, Culcay began to try to smother Derevyanchenko's offense by crowding him on the inside. This led to more exchanges and eventually Culcay's best moment of the fight, landing a clean right hand on the end of an exchange that nearly put Derevyanchenko on the mat. Derevyanchenko was able to weather the rocky moment and recover by the final round to stamp the victory by winning the 12th on all three judges' cards. The final scores were 116-112 twice and 115-113. Derevyanchenko was able to win the fight with his volume, out landing Culcay 229 to 145 and out throwing him 887 to 476, while Culcay had an advantage with a 30.5% connect rate to Derevyanchenko's 25.8%. "I thought that I won the fight," said Culcay. "It was close but I thought I edged it by a couple of rounds. I had him hurt in the 10th round. He's a good fighter but I was close to getting him out. The judges saw it differently than I did." "I want the big fights," said Derevyanchenko. "I'm ready for any of the champions. I'm not backing down from anyone."